Pitfall 3D: Beyond the Jungle is a platformer that was also released on the Nintendo Game Boy Color in 1998. There's 14 stages and your job as Pitfall Harry Jr. is to stop the evil temptress Scourge from destroying Earth. You can attack with your Rock Pick, but power-ups can be collected that include a Boomerang and a Flash Bomb that kills everything in the vicinity. Traversing the environments is generally enjoyable due to the huge levels that offer you multiple routes; sure, all paths end up leading you to the ultimate goal of opening up the exit, but the slight non-linear approach is welcome. There's even save points throughout each stage and the checkpoints are very fair. The swinging mechanic is great fun (especially as you can now shift in mid-air to sway towards or away from the camera in order to reach new platforms or collect items) and the game does a good job of encapsulating the Pitfall universe and expanding on it in fresh ways; however, personally I would like to have seen more jungle stages which the series is known for. There's also lots of trial and error (with disappearing platforms everywhere) and memorising the correct route is the only way to succeed. One of the biggest issues is perspective, as it's incredibly hard at time to recognise whether an object or enemy is in the foreground or background. 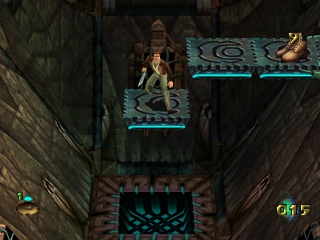 The controls are sensitive too and you can find yourself falling off the side of a platform with regularity. The combat is where things really take a turn for the worst as the controls are horribly delayed and you'll likely settle for mindless button mashing as a last resort. 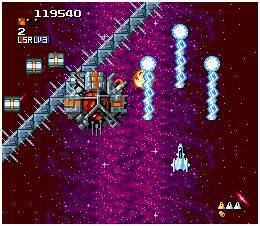 Also, the bosses feature boring, repetitive patterns, and the controls seem even more slippery than usual in these battles. Pitfall 3D: Beyond the Jungle has some decent level design and a cool swing mechanic, but overall it's a decidedly average game. In particular, the combat is entirely broken and the annoying perspective issues lead to an abundance of trial-and-error that will test the patience of most players. 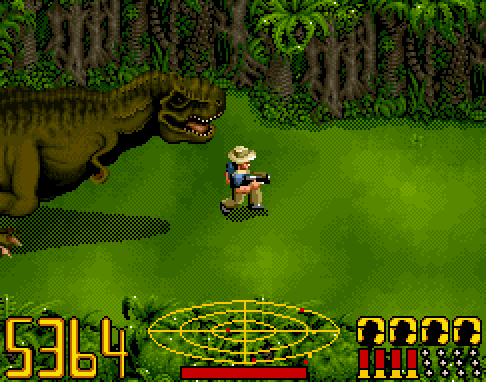 Random trivia: The in-game voice of Pitfall Harry Jr. was done by Bruce Campbell, who also narrated Spider-Man 2 (2004, PC). There's three episodes (with four levels each) and your job is to destroy the aliens and foil their plans to destroy Earth. Weapons consist of a Mighty Boot, Pistol, Shotgun and RPG, and your health can be replenished by collecting Medkits and Armor. Instead of 360° movement, Duke moves on a grid where you can walk one block at a time; no turning is involved (apart from when you're approaching the end of a corridor) and instead you can only manoeuvre up, down and strafe left/right. The graphics impress with huge sprites, detailed textures and interesting locations such as a Movie Set. 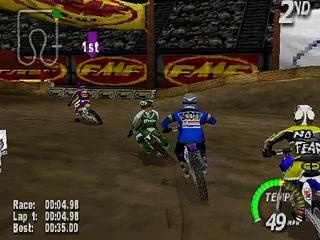 However, the trade-off is performance as the controls are unresponsive and the game engine struggles to keep up with the action, freezing for brief moments often. Another major issue is the repetitive gameplay; the arena sections are littered with the same four alien types and you simply have to keep strafing from left-to-right while inching forward through dark rooms to find the next door. 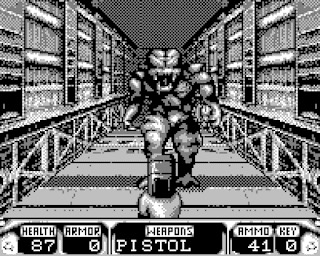 Once you've endured that you'll enter narrow corridors where you shoot enemies and then repeatedly turn 90° to find another alien waiting for you immediately, killing any suspense; irritatingly, unless you have an RPG here (for one-shot kills) you can take unavoidable cheap hits due to your inability to strafe in these corridors. Despite all of the above, the most annoying part of the entire game is the music with its repetitive and primitive bleeps and bloops that cut out whenever you walk or shoot. 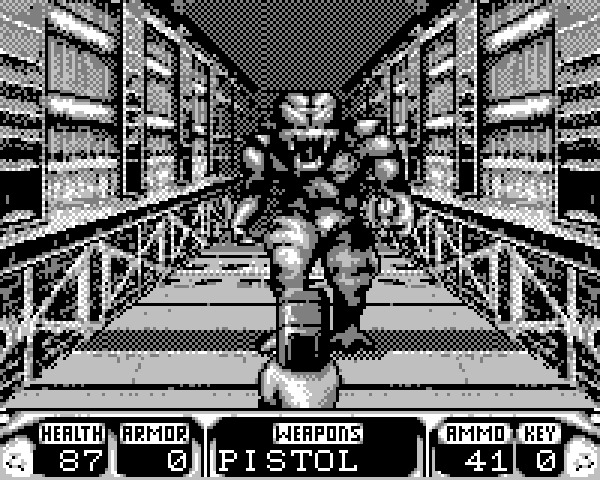 While Duke Nukem 3D is a brave and interesting curiosity, the novelty wears off quickly and it's difficult to find many good things to say about its glitchy, laggy and uninspired gameplay. In reality, it's just too ambitious for the under-powered Game.com and the end result is a forgettable title that fails to excite. Random trivia: Various cheats are available by entering certain button combinations during the pause screen.